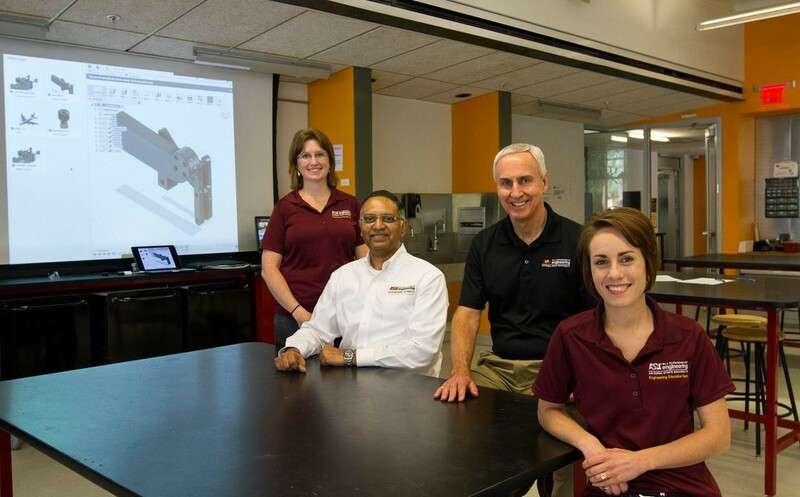 Professors in the engineering department at Arizona State University introduce their students to the entire engineering design workflow, from modeling to manufacturing, in a single tool. "Fusion 360 is a new approach to CAD, introducing a product innovation platform that enables engineers to move through the modeling process all the way to 3D printing and CNC without having to switch between applications." Simply put, not enough engineering students are graduating with the skills that they need to be qualified to fill the jobs of tomorrow. To counter this trend, and under the leadership of faculty members Dr. James Collofello, Dr. Tirupalavanam Ganesh, Alicia Baumann, and Amy Trowbridge, the Ira A. Fulton Schools of Engineering at Arizona State University (ASU) introduced Autodesk® Fusion 360TM software into their 2015–2016 FSE 100 Introduction to Engineering curriculum. Approximately 280 students learned how to design, engineer, and fabricate all kinds of products anywhere, with anyone, in a single, cloud-based tool. Pushing the limits of CAD, students used Fusion 360 to design a wearable mobile device customized to their needs. Using a Macs® or PCs, this class shattered the traditional mold of learning software in a computer lab. Freshmen worked on their own laptops in ASU’s innovative learning labs—the eSpace design studios—in open, engaging spaces designed to build excitement about engineering and encourage collaboration in a makerspace setting. The goal of the course is to teach the complete product innovation cycle, from ideation to digital fabrication. Fusion 360 was selected as the software platform to use because it is a new approach to CAD, introducing a product innovation platform that enables engineers to move through the CAD process all the way to 3D printing and CNC without having to switch between various applications. The students were able to build a 3D model, create a photorealistic rendering, share it on the cloud, and generate a file ready for 3D printing—all within one lab session. Fusion 360 is free for students, faculty, and schools, so students who wanted to continue working on their designs were able to do so easily from home, freeing them from the need to return to a traditional lab to work. With Fusion 360’s collaboration capabilities, students were also able to work with each other and outside parties. One of the students collaborated remotely via Fusion 360 with Autodesk Education Experts to develop a motorized robotic system that mimics the walking motion of a desert tortoise, to support implementation of a biomimicry project in Dr. Ganesh’s section of FSE 100. It was a learning experience for both the professors and their students. Each stretched themselves, and their freshman classrooms, to use this new product innovation platform. Professors armed their students with a strong design-through-fabrication skillset that will help them throughout their engineering education. With Autodesk’s support, ASU’s Ira A Fulton Schools of Engineering developed and enhanced this introductory module by offering a six-contact-hour workshop in April 2016 to over 50 undergraduate engineering students to learn and develop design skills in Fusion 360. Moving forward, ASU is working with Autodesk to develop design skills building through a summer leadership program for undergraduates and aims to establish a Fusion 360 certification program on its campus in the next academic year. Massive changes are happening to the design and fabrication process in the manufacturing space. ASU professors, and now students, have a clear vision of what the future of engineering looks like and the important part that tools like Autodesk Fusion 360 play. Learn Fusion 360 today with this project.